Copyright (c) 2014 Dan Reynolds. Copyright (c) 2014 Mathieu Réguer. 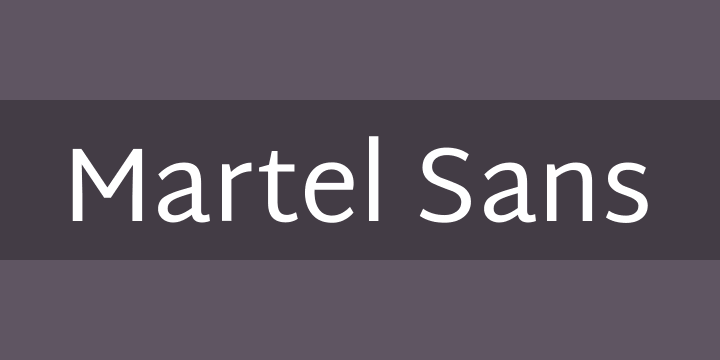 Martel Sans is a libre font development project. Currently, support for the Devanagari and Latin scripts is offered. The Devanagari character set is a monolinear design based on that from the Martel libre font project. The Latin character set is an original design; it is a humanist-style sans serif. Martel Sans was designed by Dan Reynolds and Mathieu Réguer. The Martel Sans typeface is designed for typesetting immersive-style documents. It may be used to set long passages of text in languages that are written in either the Latin or the Devanagari scripts. This includes Indian languages like Hindi, Marathi, Nepali, and Sanskrit, as well as most European languages. Martel Sans is also quite suitable for use in branding, headlines, or logos. Martel Sans’s Devanagari is designed to be used together with the fonts from the Martel family. Martel’s Devanagari is a very readable – its glyph proportions were inspired by traditional writing and calligraphic styles, and its high-contrast strokes have a diagonal axis, in keeping with the pen-angle most often used for the Devanagari writing system. Martel Sans is much more monolinear in comparison. Pairing the Devanagari character sets of Martel and Martel Sans is similar to the way designers and developers often use serif and sans serif fonts together in the Latin script.